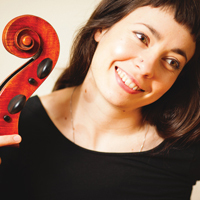 LIA KOHL is a cellist and multidisciplinary artist based in Chicago. She creates and performs embodied music and multimedia performance that incorporates sound, video, movement, theatre, and sculptural objects. She is a curator and ensemble member with the acclaimed performance ensemble Mocrep, with whom she has toured nationally and internationally. She has presented work and performed at the Art Institute of Chicago, the Museum of Contemporary Art Chicago, and held residencies at Mana Contemporary Chicago, High Concept, dfbrl8r Performance Art Gallery, and Stanford University. As an improviser, she performs regularly around Chicago and with her clarinet/percussion/cello trio, ZRL. She plays with Chicago bands Whitney, OHMME, and Circuit des Yeux. She tours regularly with Manual Cinema.